Larry, Chris and Nancy Penny at Chris's Eagle Scout Court of Honor in 2001. Christopher Penny, the son of Larry G. and the late Nancy L. Penny, graduated from Alliance High School in the Class of 2002. Eight years later he passed away, but what this young man accomplished in just 25 years was remarkable. During his high school years, Christopher was among the top 20 in his class, a member of the National Honor Society and captain of the AHS golf team where he lettered all four years. He made the first hole-in-one during match play in AHS history and repeated it again during the same season. Chris was an accomplished musician at a young age. While in high school he founded the “Alliance Strings” and played with the Alliance Symphony Orchestra. As a member of Boy Scout Troop 50, Chris achieved the rank of Eagle Scout in 2001. When Chris’s mother passed away in 2002, he and his father started the Nancy L. Penny Memorial Scholarship Fund for graduating seniors at both Alliance and Marlington high schools. 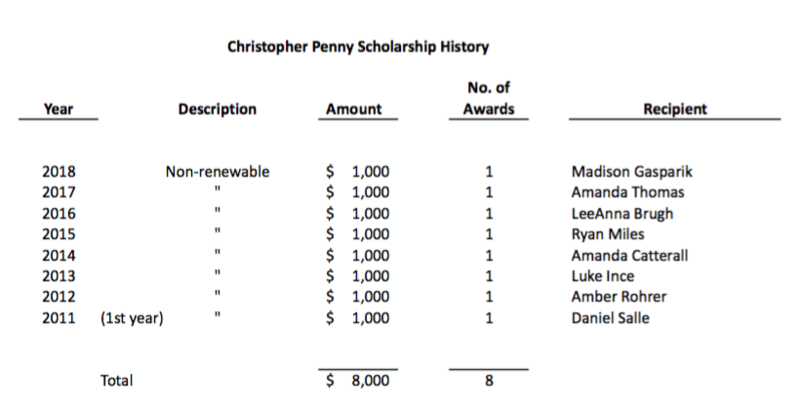 Chris penned the criteria for his mother’s scholarship. Following high school, Chris graduated from Denison University in 2006 with degrees in Business and Music. He was president of his fraternity and a member of the Denison Chamber Orchestra where he was a first chair cellist Chris was invited to solo at Julliard, the Kennedy Center and the New York City Jewish Center. He taught cello privately in his home for underprivileged children. Chris composed two pieces of music, one named “Elegy” for his mother and another named “Portrait of a Holocaust Survivor”, both of which were copyrighted. Interested in pursuing a career in law, Chris interned for Senator Richard G. Lugar with the 108th Congress and served a second internship with the National Defense Committee. He later interned with the law firm of Vorys, Sater, Seymour and Pease in Columbus, Ohio. At his death, Chris left a gift in his estate to the Alliance High School Foundation. The AHS Foundation board elected to establish this scholarship to perpetuate Chris’s commitment to education and future AHS graduates. Recipients are selected by a committee established by the family.